To all my sisters everywhere as we peel back the layers of our selves. This one made me really happy in the painting of it. Letter 3/10/97: You and I are snakes shedding our skins. Coming out of our shells, taking on new knowledge, new ways of looking at the world. I love the sensuousness of my body. You are shoving your skin off. Actually, we both have two skins – there are layers and layers of veils to shed! A brown one is also coming off. Other people are looking askance from the ground and the tree. What are we up to?! The colors and the flowers are jungle-like. It reminds me of the Garden of Eden – a myth with so many different interpretations these days. There is another way to look at this painting. The snake is an ancient symbol for the Goddess. 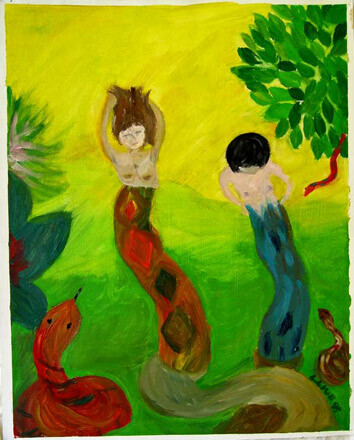 The Garden of Eden story can be interpreted to mean that the Goddess was reminding Eve not to get sucked into the stories of blame and sin and female unworthiness – not to forget her origins and the peaceful way of life of time before patriarchy. In that light we are putting on the skins of the snake. You are pulling it up. I am glorying in the feeling as it rises. It’s a bit more of a struggle for you. The other snakes are our cohorts or the old Goddesses egging us on, happy that we are joining them. The snake also symbolizes rebirth – dying to the old and taking on the new. “We’ve got to get ourselves back to the garden.” Either way we are both heeding the call to take part in the glorious process of transformation – transmutation – opening. Blessed be! Living Out Loud Show, November 2004.